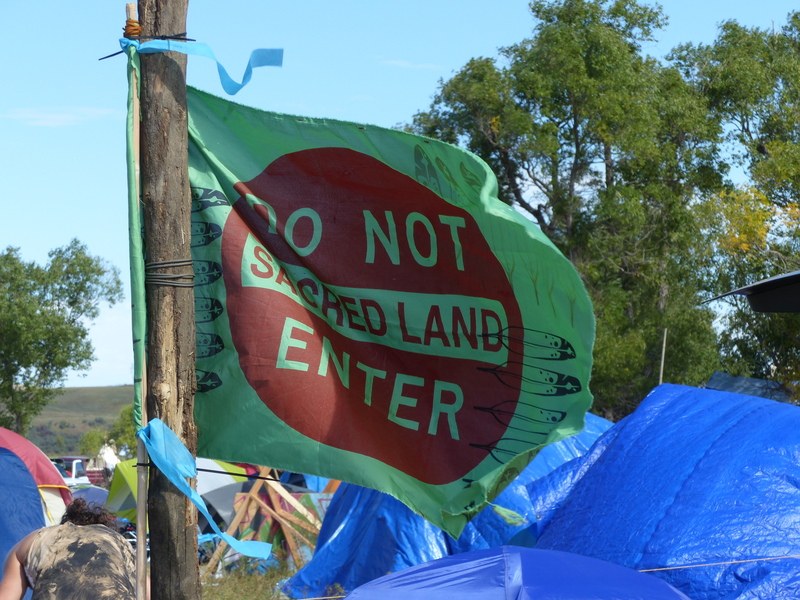 A flag flying at the Protectors Camp. Those opposing the Dakota Access Pipeline are opening a new front in efforts to stop the project: They are following the money. Pipeline opponents are putting the public spotlight on the many financial institutions funding the pipeline. A recent article in Yes! Magazine headlined: “A Strategy to Stop the Funding Behind the Dakota Access Pipeline” suggests nonviolent civil disobedience to highlight the disconnect between banks public stance on green energy and their financial backing of the pipeline. One major loan for the Dakota Access Pipeline hinges on the project getting key government permits, a point of vulnerability given the federal government’s recent action which increased environmental reviews. Yes! Magazine provided contact names for leaders of 17 of the banks so people can write letters. Also, protests at banks have sprung up across the country from Long Beach to the Bronx, the article says. For more pipeline updates and a summary of the Treaty of Old Crossings, signed on this day in 1863, read on. The companies behind the Dakota Access Pipeline — Energy Transfer Partners and Enbridge — are buying land near the Standing Rock Sioux Reservation as the next part of their strategy to make it more difficult for the land and water protectors to physically stop the project. Haas has volunteered as a member of the Red Owl Collective, the legal team at the Očhéthi Šakówiŋ, or Seven Council Fires Community Camp. The Red Owl Collective monitors any confrontations and helps those who are arrested get out on bond using donated funds. For those interested in a longer explanation of why Native peoples have risked arrest and are protecting their lands and water, here is s 25-minute video with many different voices, from the Laura Flanders Show. This country has a long history of forcing decisions on Native American communities that are not in their best interests. Today it is the Dakota Access Pipeline, but it is just the latest in a long list. Arriving at the treaty site on September 21, 1863, with a cavalcade of “290 army men, 340 mules, 180 horses, 55 big oxen and 90 vehicles and wagons”, ex-Governor Ramsey set up his tent while the soldiers set up a Gatling gun trained on the assembled Red Lake band of Ojibwe on the opposite side of the river. For more details on this depressing story, read the full Wikipedia account.